Description: BNSF power rests at the Port of Seattle in West Seattle - BNSF 2125 and BNSF 2918. Description: Local power sitting on Christmas Day. Description: Local power in non-action on Christmas Day. Description: Sunny Christmas Day looking at trains. 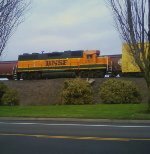 Description: BNSF non-action on Christmas Day.